The Trust’s Research and Innovation Department helps to ensure that the Trust and our patients have the opportunity to take part in expanding knowledge and understanding about treatment and care. The Trust is part of the Clinical Research Network West Midlands. The Shrewsbury and Telford Hospital NHS Trust is a significant participant in the research programmes of the National Institute for Health Research and is one of the top 100 performing Trusts in the country. Involvement in these studies helps make sure that patients at the Trust have access to rapidly developing improvements in treatments for many conditions and illnesses. In 2016-17, over 2000 patients were included in studies across the majority of fields of medicine within the Trust. Many of these studies included testing new drugs, new combinations of known drugs or new procedures in cancers, cardiovascular disease, reproductive health, neurology (including stroke and dementia), renal disease, dermatology, respiratory diseases, etc. For the latest performance figures on our clinical research trials at the Trust, please click on the link below to download the relevant document. These are provided for the National Institute for Health Research (NIHR). Carefully organised and controlled research enables Doctors, Nurses and Allied Health Professionals to test and compare new theories and treatments against the current treatments we offer to patients. Through Research we can explore different methods and learn from other people’s experience. Last year over 2000 patients took part in more than 100 research studies at our hospitals – ranging from questionnaires to trials introducing the latest treatments. Email sath.research@nhs.net or call 01743 261 000 ext 2379 to speak to the Clinical Trials Manager. For information about how your data may be used in a research setting please visit the Health Research Authority website. Shrewsbury and Telford Hospital NHS Trust delivers research across most specialties at the Royal Shrewsbury Hospital and Princess Royal Hospital Sites. We are the main provider of acute medical care for half a million people in Shropshire, Telford & Wrekin and mid-Wales. We have teams of Research Nurses, Research Radiographers Assistant Research Practitioners and Research Administrators who are based at both sites. We offer help, guidance and advice to researchers, and ensure that we have the capacity and capability to conduct new studies before confirmation is given by the Director of Research and Innovation for the trial to go ahead in our Trust. If you are a clinician wanting to get involved in research, we have a dedicated team who can support you through study design, set up, recruitment and data collection. Contact us as sath.research@nhs.net for further information. You can read more about the PIVOTAL study and our involvement here. 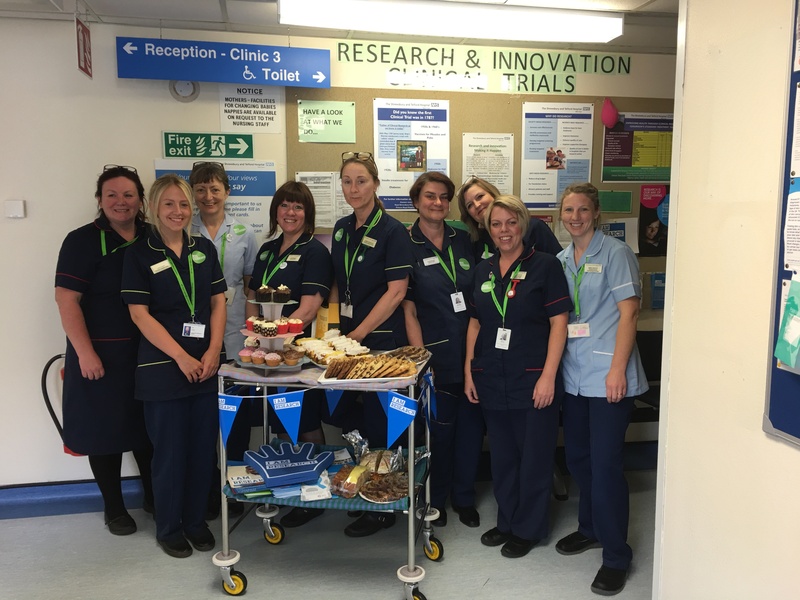 The Research and Innovation Team at SaTH celebrated International Clinical Trials Day this month by getting involved in a campaign called ‘I Am Research’. 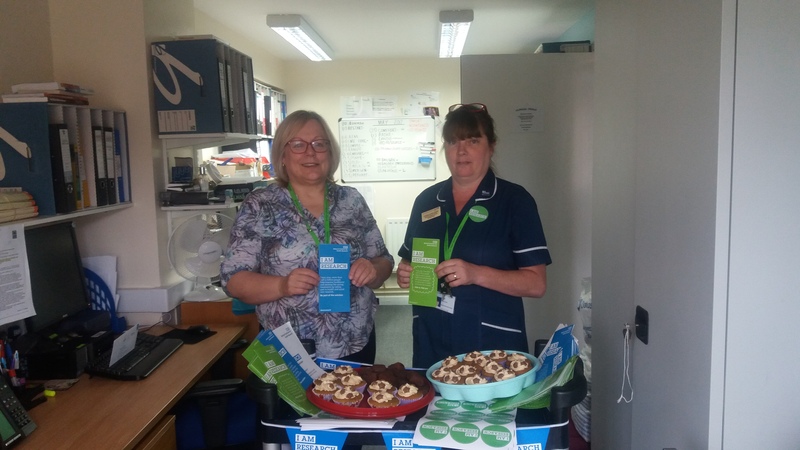 The idea of the campaign is for people to talk about great research, so on 19 May staff from the Clinical Trials Department promoted the excellent work being done at SaTH by delivering literature (and cake) and talking to patients and staff. This year Clinical Trials Day took place on 20 May and is celebrated around the world to recognise the day that James Lind started what is considered to the first randomised clinical trial. In May 1747 the HMS Salisbury of Britain’s Royal Navy fleet patrolled the English Channel at a time when scurvy is thought to have killed more British seamen than French and Spanish arms. Aboard the ship was surgeon mate James Lind, a pioneer of naval hygiene. Acting on a hunch that scurvy was caused by putrefaction of the body that could be cured through the introduction of acids, Lind recruited 12 men for his test. Without stating what method of allocation he used, Lind allocated two men to each of six different daily treatments for a period of 14 days. Those allocated citrus fruits experienced “the most sudden and good visible effects,” according to Lind’s report. The trials being done today are obviously much more complex than the test conducted by James Lind, but like Lind the team at SaTH are doing incredible work to benefit our patients. Angela Loughlin, Research & Innovation Manager at SaTH, said: “We have recruited more than 2,000 patients to take part in clinical trials over the past financial year and have more than 120 different trials on-going at the moment in 16 different specialties. The majority of these are national and international trials but we also support SaTH employees and students from various Universities to turn their research ideas into projects. “Clinical trials play a key role in helping the NHS improve healthcare and develop life-saving treatments. Here at SaTH we are doing some really interesting studies in areas such as Crohn’s Disease, Colitis and Post- Menopausal women. 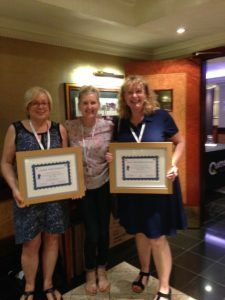 The Shrewsbury and Telford Hospital NHS Trust were the recipients of two national awards recently for their involvement and recruitment into the National MS Registry study. The first award was for the quality of the data submitted by the research team to the study centre. The second award was for the quality of the linked participant consent by online secure linkage. To date, a total of 578 patients have been consented by both Shrewsbury and Telford sites into this very important study. The aim of the study is to capture better high quality information about living with Multiple Sclerosis in the UK today. By capturing and analysing such data, we will learn more about how to improve care and develop promising treatments. Also, the development of a comprehensive register will help to fuel campaigns for fair relevant policies and guidelines, as well as overall improved health care for our MS patients. The Clinical Trials Team was recently nominated for an award at the CRN awards by the Sponsor of the Breast trial MAMMO-50. The Shrewsbury & Telford Hospital NHS Trust are the top recruiting site in the country for this trial, which aims to establish if patients aged 50 years or over can be identified who require less frequent mammographic surveillance, whilst investigating alternative methods of follow-up.